On November 8, 2013, a super typhoon never before recorded as the worst nearly obliterated Tacloban City, the capital of the Island Leyte. Coverage of the freak storm resonated all over the world's news outlets in the aftermath and in a cruel twist, Tacloban City was put on the map of the world, so to speak, not for the pluses she has, but for the state of the city after the storm. In effect, Tacloban became an international city as charity and Non-Government organizations all over the world poured out help and assistance to Leyteños in many ways they could. 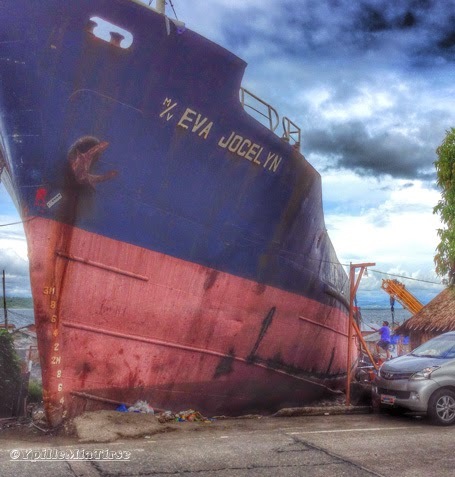 The photo above is what remains of the cargo ship named M/V Eva Jocelyn which plowed through houses and people on to the edge of the street. This has become a sad reminder that one fateful November day, Leyte suffered the most she could in over a century when 20,000 lives (estimated) perished, and a tectonic change was wrought by that dreaded typhoon named Yolanda (or Haiyan).